I am Roguedjack. And I'm learning Flash for games. 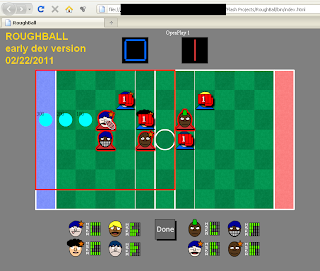 As announced in the previous episode I did work on the "campaign" mode, which is in fact League play. You start with a bad team on the lowest league level. Then its pretty standard sport league stuff. You play home and away games against AI controlled teams. Finishing first gets you promoted to the upper league, finishing last means you loose the game. The objective is to win the top league and then a match against an all-star team to get the title of "super mega winner pro elite turbo" or something like that. The match subgame is now very advanced. You can play vs yourself, perform all actions and score touchdowns. Basically play a real match, but it never ends. Here red is about to score another TD after having KOed all poor blue players. Running the game in Firefox. I'm tempted to start doing the match AI... but experience teached that it is the wrong path to choose, at least for me. I love writing AI, but I'll get tangled in AI details and the game will seem to stall. I could focus on polishing/improving the match subgame, but that can wait. I should focus on quick progress, so I'll start writing the campaign subgame. So, I've been learning Flash and AS3 since a month, about mid-january. I use Flash Develop as the main IDE, and Adobe Flash CS5 mostly for assets (vector graphics, UI elements and probably later movies). While I'm learning the technical aspect, I'm also testing game ideas. Implementing a simple user interface is very easy in AS3 and drawing vector graphics is easy too. Great. Means I can write simple prototypes very quickly. In one month of Flash I'm much more productive than one month in C#, Java or C++/C. Let's have a peek at some game prototypes I'm working on. Those are gameplay screens on the current versions. I'm roguedjack, author of Rogue Survivor, a free zombie game for windows. This blog will be about my adventures in Flash. You'll find rants, bits of code, screens and perhaps downloadable games. I've start Flash & AS3 since only a month, so don't expect grand things... yet. Will I be able to finally draw decent graphics? Will I actually release playable games? Join the adventure for FUN. You can write to me in English or French.